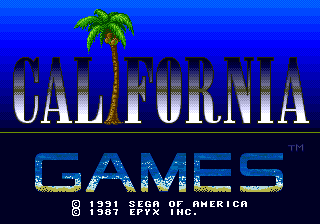 California Games, known as Jogos de Verão in Brazil, is a sports game developed by Epyx for numerous home computers and consoles, as part of their Games series, following Summer Games and World Games. The first Sega version was a Master System conversion developed by Sega themselves and released in 1989, which, like the similar NES version from around the same time, was mainly based off of the Commodore 64 version. Later, in 1991, a Mega Drive version, this time developed by Novotrade, was released, which featured brand new graphics in comparison to the other versions as well as slightly different play mechanics, but at the same time removed the Flying Disc event and the sponsorship that was present on all other versions. Much later, during the mid-90s, the Master System version was cut-up and re-released by Tec Toy as a "compilation" entitled Game Box Série Esportes Radicais, which only kept the surfing and BMX events. Main article: California Games/Magazine articles.